When I go to antique stores, I always keep an eye out for old tools. I love the way they look and how good used tools feel. More often than not, these tools are rusty, and while they'd make lovely (but dangerous) decorations, I like to find tools that I can put to use in the bindery! While in San Francisco at the Guild of Book Workers Standards, I had the opportunity to attend a presentation by Tom Conroy about tool repair. He talked about all sorts of tools and repair techniques, and during my session, briefly touched on rust removal. Conroy recommended putting a rusted tool in citric acid for not more than two to four hours to clean the rust right off. He said that the same result can be achieved if you leave a rusted tool in vinegar for around two days. Conroy also hypothesized that Sprite might work just as well, considering it's mostly citric acid. Yikes, somehow that gives extra incentive to lay off the soda for the new year! 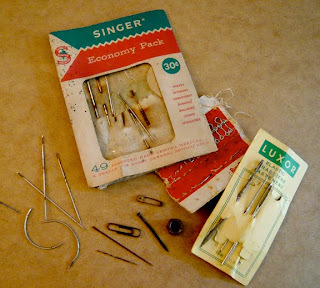 I recently acquired some rusty needles that I'd like to use to test the vinegar theory. I also googled rust removal to see if I had any other household products that might do the trick. I found a recommendation to combine Morton salt and lemon juice for a paste like consistency, which should then be scrubbed on the rust covered object. With all of these things in mind, I've decided on three experiments. 1. 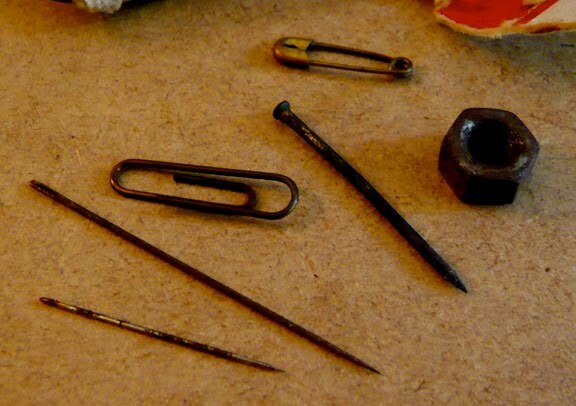 Immersing rusted needles in Vinegar, and checking their progress once each day for a week. 2. 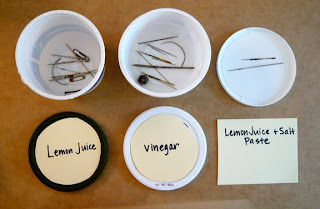 Immersing rusted needles in Lemon Juice, and checking their progress once each day for a week. 3. Scrubbing needles with the lemon juice & salt mixture (wearing a glove & holding with pliers) for a couple minutes each day, when I check the other experiments! 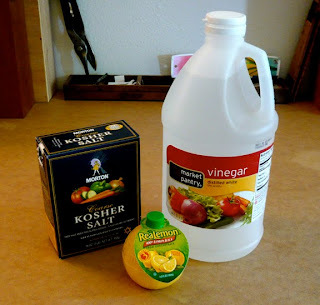 I just started this morning, so I can only report on the lemon juice and salt mixture. For about three minutes I scrubbed the needles with the mixture and a dry sponge, and it is evident that the red of the rust has been removed, but they are not shiny and new just yet. I'll keep scrubbing, and keep you updated on my findings! There'sct called "Ospho" that you can get at most hardware stores in a gallon jug.. It turns surface rust into a flaky black film that can act as a primer, or be lightly sanded off. I've used it a ton on old motorcycles parts.. and it works like a charm..
as far as I can remember, it was only $2 or $3 per gallon and is completely safe to use without gloves etc. Thanks for letting us in to your experiments. I am much looking forward to seeing more of the results! Thanks for the recommendation, Bob! Ospho sounds like a really good product. I'll be sure to mention it in the follow up. & Thanks Hilke & Rhonda! I'm already seeing results, so I'm looking forward to sharing! Coke works great for removing rust. Sometimes i pick up old weights at yard sales. A couple days soaked in coke and i don't even have to bother with a wire brush.